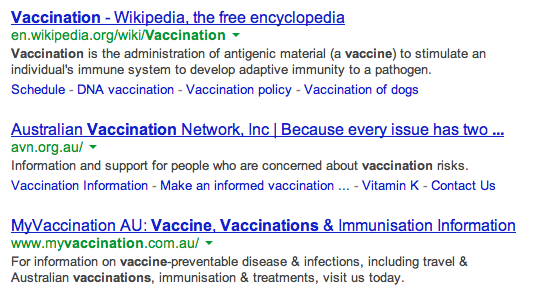 So it turns out that if you google vaccination on google.com.au, Australian Vaccination Network (AVN) comes up as the second result, right after wikipedia. As some of you may know, AVN is an anti-vaccination organisation, part of the anti-vaccination movement, whose core beliefs rests on a retracted paper published by a doctor who was struck off the UK medical register after been found guilty of unprofessional and unethical conduct. Vaccination is a corner stone of public health policy, and the only means of protection for the most vulnerable amongst us who are unable to receive vaccinations. Through vaccination smallpox was eradicated in 1979, and no child was ever again killed or maimed by it. Due to the efforts of groups like the AVN however, there has been recent decline in the number of children receiving vaccinations against common childhood whooping cough, leading an outbreak of whooping cough in Queensland, and sadly, the death of several infants. If you have a blog, make a post like this one, google vaccination on google.com.au and click on every result that is NOT AVN.